Instant! Safe! Neat! Efficient ! 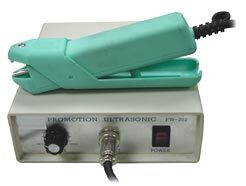 Dual heat multi-purpose hand held ultrasonic heat sealer. Makes a 3 mm x 5 mm spot seal. Ideal for sealing thin clam shells or for tacking. No waiting time to preheat. To spot seal OPS, PSP, PVC, and EPS food containers.